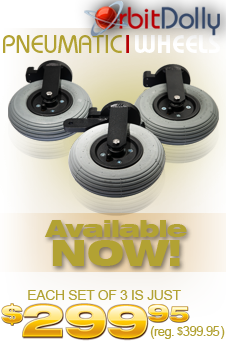 THE ORBIT DOLLY 8" PNEUMATIC WHEEL SET is something every Orbit Dolly owner will want to add to their production gear kit. The larger air filled wheels in this set can drastically increase the number of shooting environments in which you can use the Orbit Dolly. 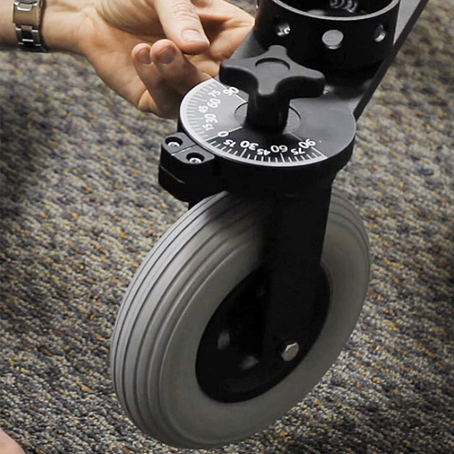 While the standard wheels provided will give you smooth movement in most studio situations, there are occasions when you may want to take the dolly on location to areas where the surface is uneven or rough such as concrete floors with expansion cracks, ceramic tile or textured carpeting. 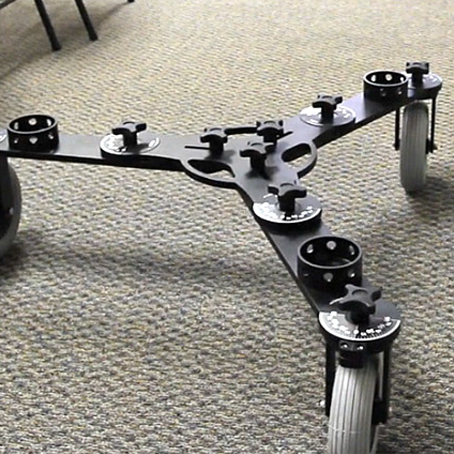 These surfaces produce more vibration and shake through the wheels of the dolly to your camera because of the frequent changes in surface height. Pneumatic tires provide a variable and flexible cushion of compressed air that absorbs shock while keeping the wheels in close contact with the ground. The larger diameter of these wheels also means less revolutions over the same distance and a resultant smoother ride. Because the internal air pressure of a pneumatic tire acts in all directions, it is able to "absorb" bumps in the rolling surface without producing vibration and shake which can affect your footage. The high-quality medical-grade rubber used can also withstand a lot of wear and tear while still maintaining its resilience. Shock Absorption: Air is a natural shock absorber and an air filled tire means less vibration and a steadier motion on a wider variety of surfaces. Micro-incremental Air Pressure Adjustment: You can adjust the tire pressure to suit the shooting or terrain situation. 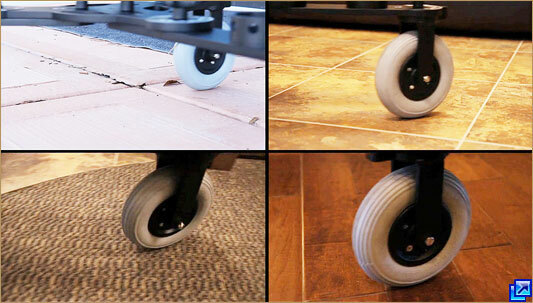 Use less pressure for a softer more forgiving ride on more uneven or rougher surfaces. 36psi Maximum Pressure: You get more than enough support for the heaviest rigging or camera setups that you might need to carry on the Orbit Dolly. Standard Schrader Valve: Using a common valve type, like those used on most car and bicycle tires, makes for easy refilling with just an inexpensive bicycle pump. 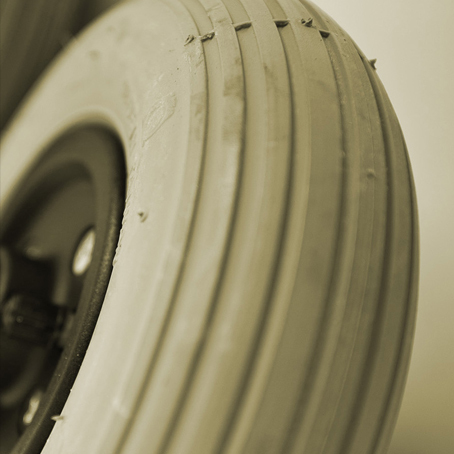 Medical Grade Rubber: This is not your garden variety rubber tire. 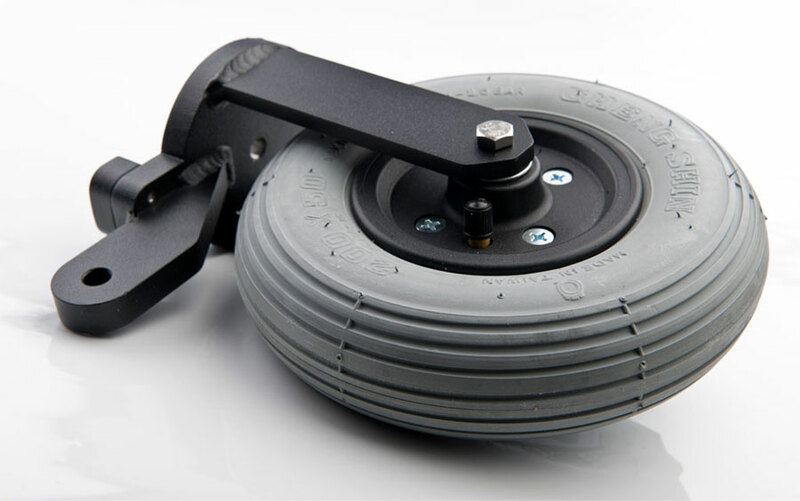 Because we are using the same grade of rubber found on many personal medical transport devices, the Orbit Dolly pneumatic tires can withstand extremes in temperature, more stress and more wear and tear than lower grade rubber options. 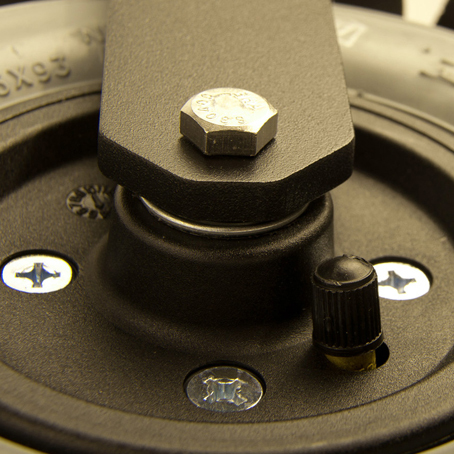 Light Grey Non-marking Rubber: You can take the Orbit Dolly on any set, from green screen to pure white without leaving a mark. Concentric Ribbing: The ribbed surface of the tires provides better traction and better tracking, keeping the tire moving straighter in your desired direction, especially on uneven surfaces. Large 8" Wheel Diameter: Less revolutions over the same distance means a smoother ride overall than regular wheels, with less vibration through the dolly apparatus. Sealed Wheel Bearings: Sealing the wheel bearings away from dirt and exposure means maintenance free operation for the life of the product. 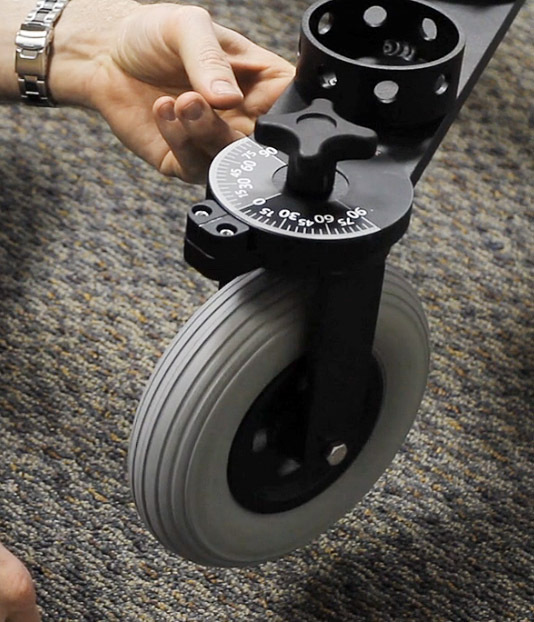 ABS Plastic Hubs: Using a lightweight material like this means the wheels add less weight to the dolly, and there is therefore less rolling resistance, so the dolly is easier to accelerate and decelerate during shooting and it is easier to carry and store when not in use. Same turning radius as standard 3"wheels: Since the 8" pneumatic wheels rotation point is in line with its axle, this wheel set will behave the same in terms of its arc tracking ability as the standard 3" polyurethane wheel set. 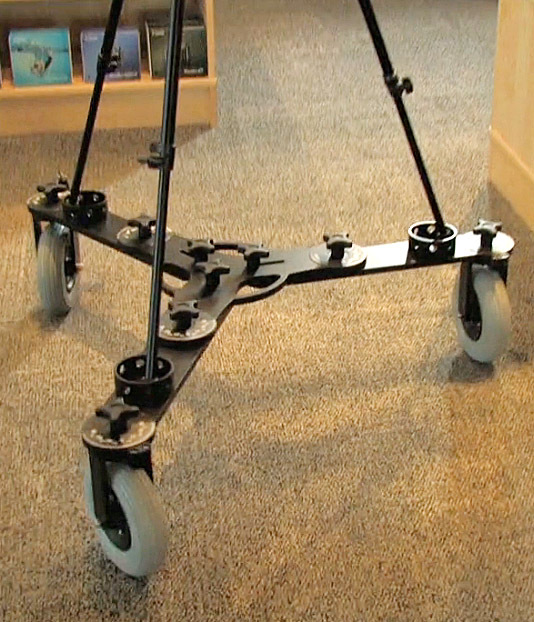 Same hardware as standard 3" wheels: The same mounting bolts used to attach the standard wheels to the dolly are also used to attach the pneumatic 8" wheels, so you only need to carry one set for any situation. DIMENSIONS: Tire Diameter: 8"/ 200 mm, Tire Width: 2"/ 50 mm, Axle size: 5/16"
MATERIAL: 1/2 inch aluminum plate (series 6061) with industrial matte black powder coating (wheel assembly), high grade stainless steel (axle bolts and nuts), ABS plastic (hubs), medical grade non marking rubber (tires). 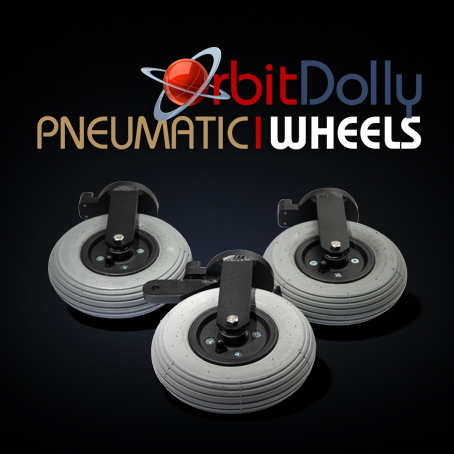 What types of surface is the Orbit Dolly 8" Pneumatic Wheel Set designed to handle? 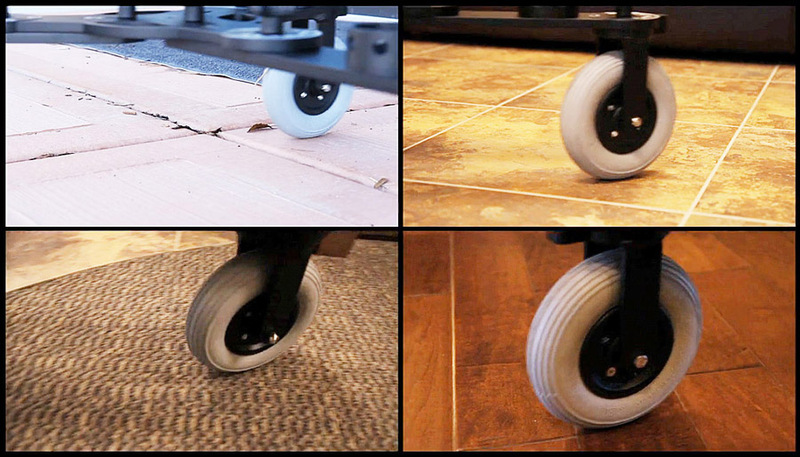 The Pneumatic Wheel Kit can handle anything from slightly textured office carpet to concrete with expansion joints, tile floors, hardwood plank flooring, outdoor pavement and gravel free dirt. Will this set of wheels add a lot to the weight of my gear kit? We have done our best to minimize the overall weight of these wheels without sacrificing durability. For example, the metal used for the wheel assembly is the lightest possible aluminum alloy and the central wheel hub is made from lightweight ABS plastic. 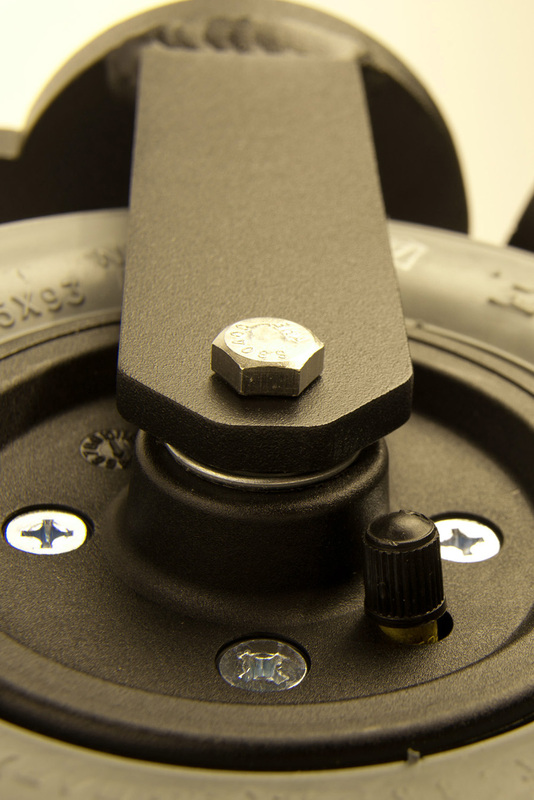 You also only need one set of attachment knobs since the standard knobs that come with the dolly work for the larger wheels as well. Will excessive heat - like leaving my wheels in the back of my van, or using them on blistering hot pavement -- affect the durability of the rubber in these wheels? The rubber used in the pneumatic wheel set is high quality medical grade rubber, designed for the rigors of constant use. We chose this rubber, as opposed to the cheaper, lower grade rubber used in wheelbarrows or moving carts, specifically for its durability and ability to survive the stress of day to day use. How much extra work will I need to do to keep the pneumatic wheels rolling smoothly? Other than the occasional wipe with a wet cloth to keep the rubber surface clean, these wheels are pretty much maintenance free. 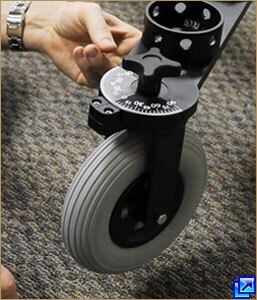 The sealed bearing wheels never need re-greasing or cleaning since no dirt can get in to affect the bearings. 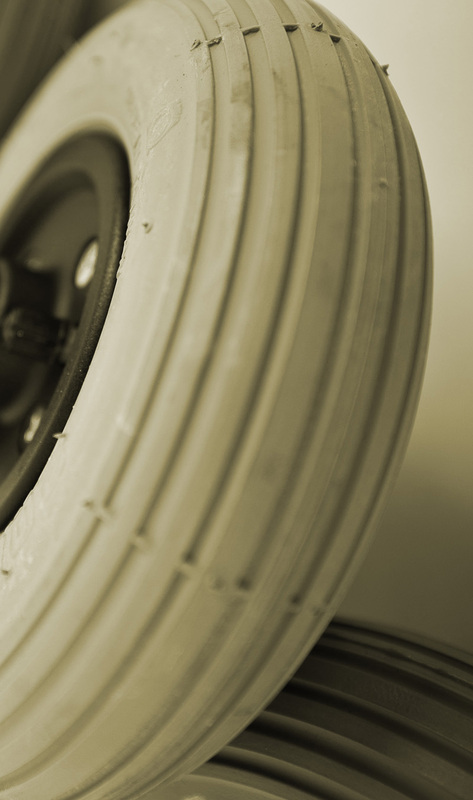 Shock Absorption Air is a natural shock absorber and an air filled tire means less vibration and a steadier motion on a wider variety of surfaces. Micro-incremental Air Pressure Adjustment You can adjust the tire pressure to suit the shooting or terrain situation. 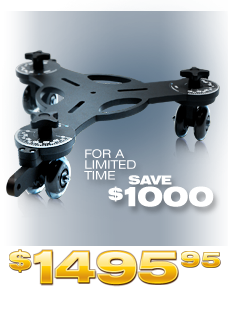 Use less pressure for a softer more forgiving ride on more uneven or rougher surfaces. 36psi Maximum Pressure You get more than enough support for the heaviest rigging or camera setups that you might need to carry on the Orbit Dolly. Standard Schrader Valve Using a common valve type, like those used on most car and bicycle tires, makes for easy refilling with just an inexpensive bicycle pump. Medical Grade Rubber This is not your garden variety rubber tire. 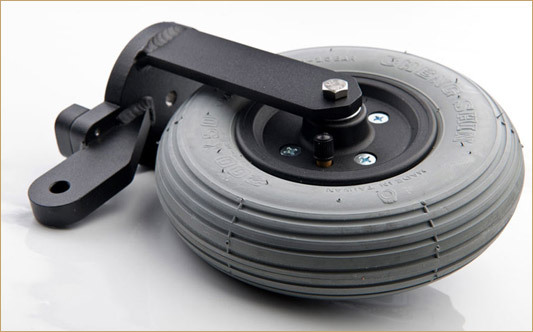 Because we are using the same grade of rubber found on many personal medical transport devices, the Orbit Dolly pneumatic tires can withstand extremes in temperature, more stress and more wear and tear than lower grade rubber options. Light Grey Non-marking Rubber You can take the Orbit Dolly on any set, from green screen to pure white without leaving a mark. Concentric Ribbing The ribbed surface of the tires provides better traction and better tracking, keeping the tire moving straighter in your desired direction, especially on uneven surfaces. 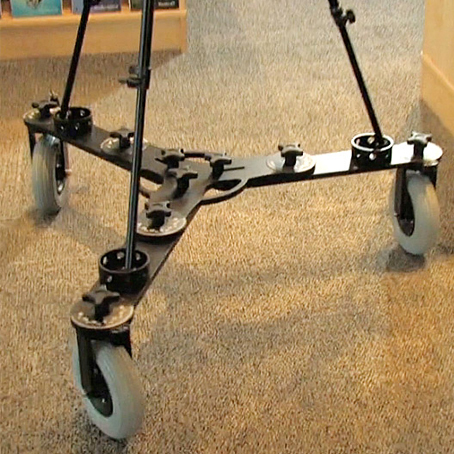 Large 8" Wheel Diameter Less revolutions over the same distance means a smoother ride overall than regular wheels, with less vibration through the dolly apparatus. Sealed Wheel Bearings Sealing the wheel bearings away from dirt and exposure means maintenance free operation for the life of the product. 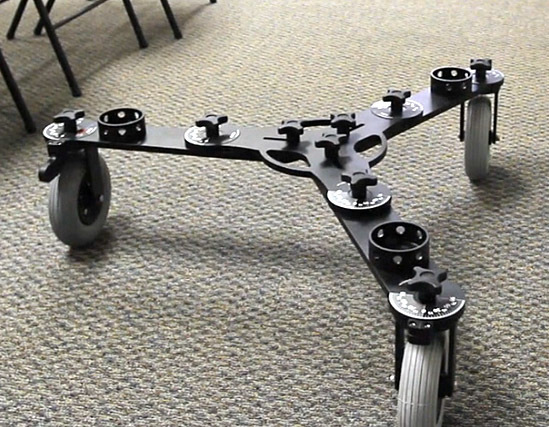 ABS Plastic Hubs Using a lightweight material like this means the wheels add less weight to the dolly, and there is therefore less rolling resistance, so the dolly is easier to accelerate and decelerate during shooting and it is easier to carry and store when not in use. Same turning radius as standard 3"wheels Since the 8" pneumatic wheels rotation point is in line with its axle, this wheel set will behave the same in terms of its arc tracking ability as the standard 3" polyurethane wheel set. Same hardware as standard 3" wheels The same mounting bolts used to attach the standard wheels to the dolly are also used to attach the pneumatic 8" wheels, so you only need to carry one set for any situation. DIMENSIONS Tire Diameter: 8"/ 200 mm, Tire Width: 2"/ 50 mm, Axle size: 5/16"
MATERIAL 1/2 inch aluminum plate (series 6061) with industrial matte black powder coating (wheel assembly), high grade stainless steel (axle bolts and nuts), ABS plastic (hubs), medical grade non marking rubber (tires).